It's been several weeks since I planted my Earth Box so I thought I'd give an update on how it is doing. The last frost date for this area came and went on May 15th, however, I actually planted my pole beans much earlier (around mid-April). It seems I would have saved myself much time by just waiting for the May 15th planting date. The temperatures here, while fairly mild during the day, would dip dangerously close to freezing during the darkest part of the night. I spent a lot of time moving the container in and out of the garage the first month. That being said, the seeds germinated just fine and broke ground, but because the soil took awhile to warm up, the bean plants stayed a small size for most of May. Out of habit, I planted 2 seeds per hole. All but 2 seeds came up. Then I lost another couple plants, probably to wildlife. Still, I worried about overcrowding the roots as the plants get bigger. Even when May 15th came, we were bombarded by various hailstorms for the next several days which did a lot of damage to my other plants - especially my hydrangea which found itself with its leaves riddled with holes. Once again, the pole beans spent a lot of time in the garage. Towards the tail end of May and on into early June, the bean plants, with the help of consistently warm temperatures, started growing rapidly...VERY rapidly! Where I was watering the plants about 1/2 gallon a day, now I am watering them about a 1/2 gallon every morning and another full gallon at night! I'm thinking I could have easily afforded to thin out the plants a few weeks ago. The plants look so lush and beautiful - much nicer than they ever did when planted straight in the ground. I'm still a couple weeks away from harvesting, maybe longer because of the slowed initial growth, but I'm looking forward to harvest time! Oh man, it makes me hungry just looking at it! Time to eat! Colorado Renaissance Festival - HUZZAH! I knew before we ever moved here that I wanted to go to the Colorado Renaissance Festival. We only made it one year to the Carolina Renaissance Fest in Huntersville, NC but everyone loved it! So when I announced the Colorado Renaissance Festival coming up in June, we all looked forward to going. My best friend was also going to be in town visiting with us that weekend so we made our plans around the festival. On the way down I-25, following the directions Bing gave us, we got lost in Castle Rock. As it turns out, I guess the address we had was for the main offices of the Renn Fest - not for the location of the Festival itself. If you happen to be going to the Renn Fest, just take I-25 South from Denver to Exit 173 then turn right and follow the signs. There's not much out there so it's very likely you could just follow the traffic directly to one of the Renaissance Festival's parking lots. We were attending on the 2nd day of the first weekend. Although we got there an hour after it opened, we were already sent to the "additional parking" zone. It wasn't a problem, though since shuttle buses came at frequent intervals to take us to the main gate. We'd already gotten our tickets at a King Soopers grocery store near the house so there was no need to wait in line. We did have to guzzle the water bottles we brought with us since no outside food or drinks were allowed past the front gate. Once inside the gate, we were transported back to medieval times. So many people, participants and visitors, were dressed in period costume. There were so many things to see and do that we just started wandering around to try to take it all in. We didn't get to see any of the stage shows, but we'll definitely make time for that next time. The Girl was thrilled to meet up with Twig - the same fairy she met back in 2008 in North Carolina. She was just as beautiful and just as perfect a fairy as anyone could ask for. Luckily, they were fairly close by. We decided it was time to enjoy some refreshments. The boys opted for a couple of smoked turkey legs. We also tried some scotch eggs, apple cobbler and grilled corn on the cob. Mmmm! We were at the festival from about 11:30 am to 5:30 pm. It's hard to believe anyone could spend so much time there, but frankly, it wasn't enough time to see and do everything. This is definitely a "multiple visit" type of place! We've already decided to make it an annual destination...HUZZAH! The Girl loves to help out in the kitchen - especially when I make her favorite Bean Salad. But with all those cans to open, her little hands get very tired very quickly and she starts to get frustrated. I thought it was time for me to look into getting an electric can opener. 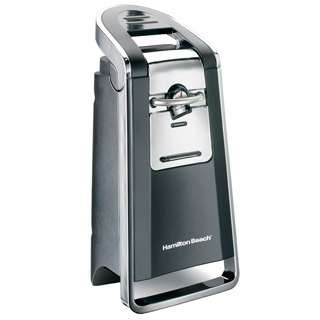 I found a very nice Hamilton Beach brand can opener at the thrift store for $6. I plugged it in to see if it would at least run (I didn't have a can to test it on) and since it seemed to work just fine, I took it home. Come to find out, it is a "smooth top" can opener so it leaves no sharp edges after opening cans. It is very easy to use and now my daughter can open every can we need! One of the requests we got from my best friend before she arrived in Colorado this summer for a visit was to take a day to visit the Rocky Mountains. We thought of driving through them. We thought of heading up to the Rocky Mountain National Park. Then Mr. LH came across the Georgetown Loop Railroad. We liked the small town of Georgetown from previous visits and knew that area was absolutely beautiful so we looked into the railroad. Built in 1884, the Georgetown Loop Railroad was originally used to connect the two mining towns of Georgetown and Silver Plume. Today, it is a tourist train with open car seating following the same route. It snakes it's way up the mountain about 600 feet in elevation. This was a fantastic way to view the scenery! On the way back, you have the option of stopping off at the Lebanon Silver Mine. This is an additional fee when you purchase your train ticket. The walking tour takes you 500 feet into the original silver mine. When the price of silver dropped at the end of the 19th century, mine owners collapsed the entrances to their mines to protect their claims. Because of this, apparently when I-70 was built (right over the mine) they had no idea the mine was even there! Hard hats are required in the mine, but they are supplied at the beginning of the tour for no additional fee. It is a constant 44 degrees in the interior of the mine, too so you may want to wear a jacket. We all had a great time on this trip into the Rockies. And although we didn't get beyond the continental divide, the views, as usual, were spectacular!